VANCOUVER, B.C.—Few soccer players ever score five goals in a single match, but Amy Rodriguez did it in 30 minutes Friday. Coming on at halftime for Tobin Heath, Rodriguez dominated right from the start, scoring her first goal just 57 seconds into the half off a feed from Lauren Cheney and quickly adding four more as part of the U.S. team's 14-0 thumping of the Dominican Republic. For Rodriguez, who isn't usually praised for her scoring touch (she has just five career goals in two FIFA U20 World Cups, one World Cup and one Olympic tournament) and who was held off the scoresheet in last summer's World Cup, it was a remarkable showing, and a suggestion that she's an important part of this team alongside more well-known names like Abby Wambach, Heather O'Reilly and Alex Morgan. Rodriguez said afterwards this was a unique experience. "It's never happened to me before," she said. "I couldn't have asked for more." She was quick to deflect praise as well, citing her teammates' contributions. "We played as a unit, and a lot of our goals came off great combination play," she said. Rodriguez's five-goal game puts her in elite company; only four other American women have ever done that, including past legends Brandi Chastain, Michelle Akers and Tiffeny Milbrett and current legend Wambach (who had two goals herself Friday). Wambach said it was remarkable to see Rodriguez do so well in such a short span. "It's amazing," Wambach said. "That's got to be some kind of record." Wambach said it was special to see Rodriguez do so well given her recent goal-scoring drought. "Amy hasn't scored a lot of goals in the last 10 games or so we've played; she was due, and this is a perfect game for a player like that to get some confidence," Wambach said. "If you can ever get a chance as a forward or as a soccer player to score five goals, you relish it, you take it, and you go to bed with a smile on your face." Despite their status as a heavy favorite, the U.S. has had some letdowns in qualifying tournaments recently, most notably finishing third in the Mexico-based qualification tournament for the 2011 World Cup. Rodriguez said that experience has inspired them to play hard throughout this tournament and keep focusing on improvement, even when games are well in hand. "We walked away from Cancun very disappointed in ourselves," she said. "We're not going to let that happen again." Rodriguez said she had a good feeling even before Friday's match started. "I felt really strong today," she said. "I'm glad I was able to go out there and have a good game." 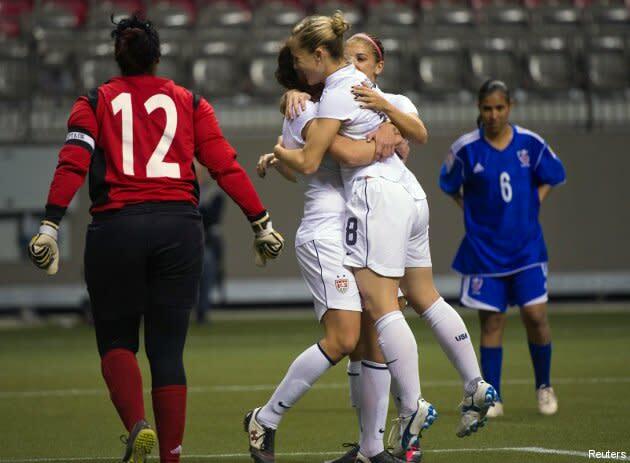 She said it helped to come in with the U.S. already firmly in control; the score was 7-0 when she entered at the half. "I'm used to coming into a match where we need to score goals, where we're either tied or down, and it's a pressure situation," Rodriguez said. "Today I came in with a little more comfort, you could say, but at the same time, I have things I'm trying to work on, things the coaching staff are trying to get me to work on, so I tried to do those today, and fortunately today it paid off for me." Rodriguez said she's been tweaking her game recently, and it paid off. "I've been working on my crosses, my driving the ball, a lot of my finishing, my shooting chances and taking on 1v1s," she said. "I tried to incorporate those into my game today, and I think I did." 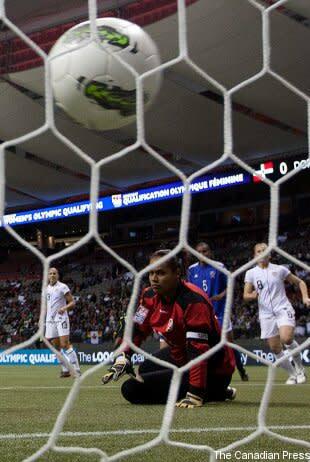 U.S. coach Pia Sundhage said it was terrific to see Rodriguez get on the scoresheet in such spectacular fashion. "She didn't score in the World Cup, but leading up to the World Cup, she was playing well, and she played well in the World Cup," Sundhage said. "I'm really happy for her and for the team, because we talked about her and how she can change her game to be successful out wide, to the left and to the right. Obviously she can play up top as well. This start was more than I could ask for, scoring that many goals." Sundhage said Rodriguez's incredible performance showcases the depth the American side has. "This is good not only for her, but for the team," Sundhage said. "It's really hard to make the team right now. We have so many good players. I think this is the best team I've ever had since 2008." Rodriguez said she didn't let her lack of goals in the World Cup get her down, and she didn't even focus on not registering one until after the fact. "So much of my World Cup was clouded by our wins," she said with a laugh. "I was never down on myself until it was, you know, mentioned, so thank you for bringing that up! I was so proud of the way our team performed in that World Cup. We got to the finals, and unfortunately we lost, but hopefully this will be a great year for us again and a great year for me as well." Rodriguez said Friday's game was the perfect way for her and the U.S. team as a whole to get the year off on the right foot. "I'm glad we could open this tournament with a big bang."